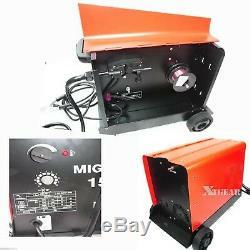 Commercial Dual MIG 150 110V 150AMP Flux Core Wire Gas No Gas Welding Machine. Voltage: 110V / 60 Hz Single Phase. 40 - 150 AMP (MIN). 10% at 140AMP 21.5V. 60% at 40 AMP 16V. Max open circuit voltage: 34.2V. 031 (0.8mm) steel & stainless steel 0.030" to 0.039" (1.0mm) aluminum. 0.023" to 0.035"90 (0.6-0.8mm) flux core. Torch with full ON/OFF safety control. Easily converted to gas operation. 150AMP MIG 150 Welder w/ Wheel. 2.5M Torch, xtra 2 Tips. Please make sure you order the correct item as orders cannot be altered after the order is paid for. The flat rates quoted in the table will apply to most destinations in the countries/states listed. Customers must return all items in their original condition which include the original Packaging accompanied with packing slip, Documentation & Manuals and Accessories, etc. We welcome and treasure all of our customers. WARNING: Proposition 65 requires California to publish a list of chemicals known to cause cancer, birth defects or other reproductive harm. Listing and template services provided by inkFrog. 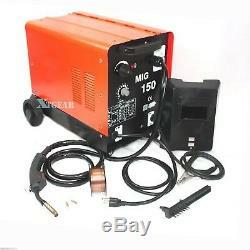 The item "Commercial Dual MIG 150 110V 150AMP Flux Core Wire Gas No Gas Welding Machine" is in sale since Thursday, June 12, 2014. This item is in the category "Business & Industrial\CNC, Metalworking & Manufacturing\Welding & Soldering Equipment\Welding\Welders, Cutters & Torches\TIG Welders". The seller is "xtgear" and is located in Rowland Heights, California.